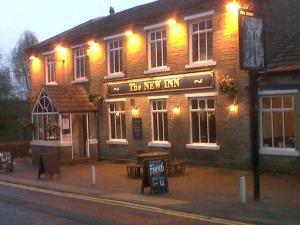 The New Inn01274 921505work Public HouseTraditional pub dining in a family friendly and comfortable surroundings. All our food is home made using The core of the menu surrounds a selection of pie’s in puff pastry with hand cut chips and peas, burgers in sour dough buns with French fries and salad, premium cut steaks with all the trimmings and peppercorn sauce. Hunters chicken is very popular and our Sunday roasts. Childrens meals available, also home made. We offer a 10% discount for pensioners, and a discount for children accompanied by an adult ordering from the main menu. Traditional pub dining in a family friendly and comfortable surroundings. All our food is home made using The core of the menu surrounds a selection of pie’s in puff pastry with hand cut chips and peas, burgers in sour dough buns with French fries and salad, premium cut steaks with all the trimmings and peppercorn sauce. Hunters chicken is very popular and our Sunday roasts. Childrens meals available, also home made. We offer a 10% discount for pensioners, and a discount for children accompanied by an adult ordering from the main menu. Vegetarianoptions include, country vegetable pie with hand cut chips and mushy peas, vegetable curry with pilau rice and mango chutney dip, quorn and spicy bean burger with salsa dip, French freis and salad. Just a few hundred yards from the birthplace of the Bronte’s, wonderful scenic walks over the viaduct, and next door to South Square art gallery. South facing Sun terrace for the summer and wood burning stoves for the winter.